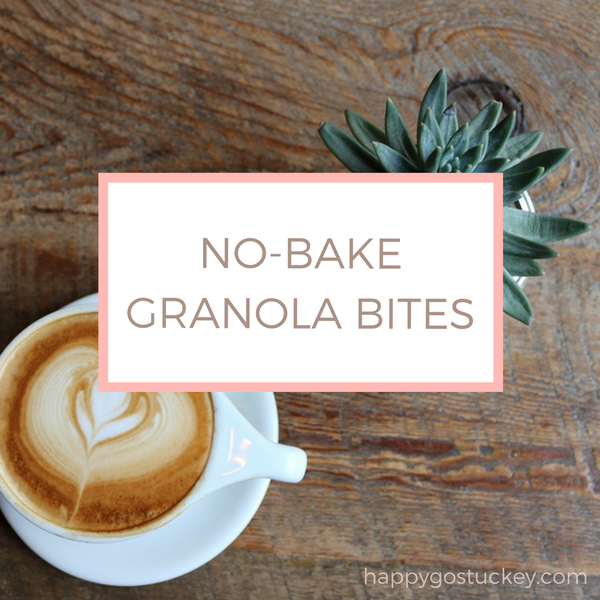 These No-Bake Granola Bites make a fantastic snack, a perfect choice to take to a new mom who needs quick calories, a delicious and sneakily healthy dessert for little ones, or the perfect treat with your afternoon coffee. Ask me how I know. This recipe is one I have tweaked from pulling several other recipes together. Some called for things we didn’t care for, so we just substituted ingredients we do like– and you can totally do that with these– make them your own! **Combine all the ingredients in a bowl and place in refrigerator for 1 hour. Then roll into balls, I used a tbs. size disher– and keep refrigerated. Sometimes they are messy to roll, wet your hands and it will be a bit easier. These look so good! Do you think it would still work with sunbutter or almond butter? My little has a peanut allergy. Love following your blog by the way! Haley, I’m sure you could!! Maybe use a thicker almond butter just so it holds together– please let me know if you try it and it works! Thanks for stopping by friend! Made a version of these today! Thanks for sharing!